So much has been written about working women recently, but the headlines and the statistics don�t tell the whole story. Are we supposed to be leaning in or opting out? Can we have it all or are we asking for too much? The truth is more complicated than the headlines. More and more women today are breadwinners, and these breadwinners are caught in a perfect storm of male-dominated culture at work, traditional social norms at home, and outdated school schedules that don�t gel with work schedules. Join us for a preview of the new book Mogul, Mom & Maid: The Balancing Act of the Modern Woman, which tells the real stories of working women. Using examples from her own life, as well as lessons learned from the women featured in the book, author Liz O�Donnell, will examine the choices women are making, the options they have, and the impact these decisions have on women, their families, and the businesses that employ them. Meeting Notes: Appetizers and beverages are provided. If you or your company wish to host or sponsor an event please email Deb Stark, Regional Network Director. Liz O�Donnell is a public relations executive, and primary breadwinner in her family. She is founder of Hello Ladies, named one of the top 100 websites for women by Forbes and a Voice of the Year by BlogHer. 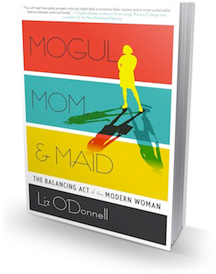 O'Donnell is the author of the forthcoming book Mogul, Mom & Maid: the Balancing Act of the Modern Woman, named one of the top 10 business books for fall by Publishers Weekly. VMware (NYSE: VMW) is the leader in virtualization and cloud infrastructure solutions that enable businesses to thrive in the Cloud Era. Customers rely on VMware to help them transform the way they build, deliver and consume Information Technology resources in a manner that is evolutionary and based on their specific needs. With 2012 revenues of $4.61 billion, VMware has more than 500,000 customers and 55,000 partners. The company is headquartered in Silicon Valley with offices throughout the world. Find out more here. VMware�s WIRED (Women in R&D) has spearheaded this WITI relationship locally and serves VMware�s female engineers. WIRED�s mission is twofold: to support women in R&D at VMware; to sponsor, nurture, and support girls in STEM fields. Contact Felicia Jadczak at VMware for more information..